What is a Cross-Party Group? Cross-Party Groups (CPGs) provide an opportunity for Members of Scottish Parliament (MSPs) of all parties, outside organisations and members of the public to meet and discuss a shared interest in a particular cause or subject. Before its dissolution ahead of the Scottish Parliament elections in May 2016, Genetic Alliance UK supported the CPG on Rare Diseases, which was established in 2013. During the Scottish Parliament elections in May 2016, Genetic Alliance UK worked with patients in Scotland on our Pledge for Patients campaign, which aimed to engage candidates in issues facing patients with rare, genetic and undiagnosed conditions and their families. Since then, Genetic Alliance UK has continued to raise the profile of rare, genetic and undiagnosed conditions in Holyrood by working with the Scottish Government and a number of Members of Scottish Parliament, with the aim of re-establishing a CPG on Rare, Genetic and Undiagnosed Conditions. 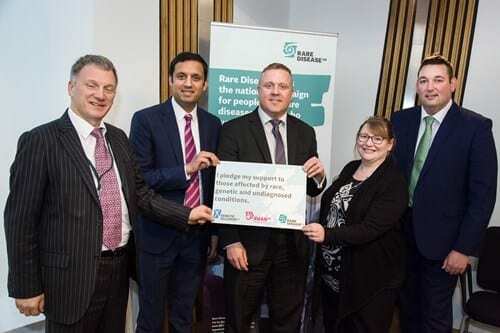 On Tuesday 29 November, our campaign Rare Disease UK hosted a briefing session on the implementation of the Scottish Rare Disease Plan with MSPs in Holyrood. They were joined by patients and families affected by rare, genetic and undiagnosed conditions. The session also featured short speeches from Fiona Murphy (Director of National Services Division), Alan McNair (Senior Research Manager at Chief Scientist Office) and our Director, Alastair Kent OBE. It was a fantastic opportunity for MSPs to find out about the Scottish Rare Disease Plan, and also to learn about supporting those in their constituencies who live with rare, genetic and undiagnosed conditions. You can read about this event on the Rare Disease UK website. You can also read SWAN UK member Wendy Meek’s speech here. We will keep you posted on our progress here, and in our news section. If you have any questions, or would like some further assistance, please contact Natalie Frankish, Policy and Engagement Manager for Scotland on natalie@geneticalliance.org.uk.